Time to write to Santa Claus! Don't miss your chance to tell him exactly how good you've been all year and what you'd like to see under your tree Christmas morning. Our customizable letters make it easy for you and your kids to fill in all the important details. 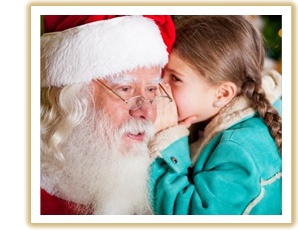 When you're done, bring it in for two free pictures with Santa and a special gift from House of Holiday! Santa Claus is here! As busy as he is, he always makes time to stop by House of Holiday for pictures and laughs. So hurry down with the whole family! Spend an afternoon shopping, eating cookies, and getting wrapped up in the Christmas spirit. But don't forget your letters! Every child who brings in a letter to Santa gets two free pictures and a surprise gift from House of Holiday. Nothing says Christmas quite like a visit from Santa…right? Well, Mrs. Claus doesn't think so! 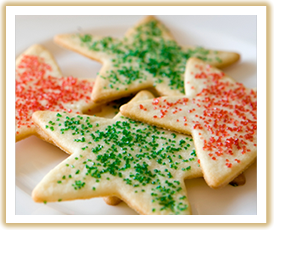 If you ask her, it's the arrival of her famous star cookies that marks the start of the holiday season. Children (and parents) have been singing their praises and making more trips than they can count to House of Holiday just to meet the modest baker. Still not convinced? Then stop by and find out for yourself why Mrs. Claus' cookies make Christmas even better!